Skin cancer is the most common type of cancer in Australia. Dermatoscopy is a very specialised skill in skin cancer detection involving a special “microscope“ to examine moles and skin lesions. This method increases the rate of early skin cancer detection, especially for pigmented lesions. Early detection will help to reduce the morbidity and mortality rates from dangerous skin cancers like melanomas. Our doctors have received specialised training in Dermatoscopy as well as surgical techniques to remove skin cancers. Dr Richard Shawyer has a Diploma of Dermatology. We recommend you have a skin cancer check at least once a year. We use state-of-the-art dermatoscopic and photographic equipment to monitor skin lesions for more accurate detection of any type of skin cancers, including scc, bcc, and melanomas. We also provide a wide spectrum of surgical and non-surgical treatment options,. Prevention is better than cure! 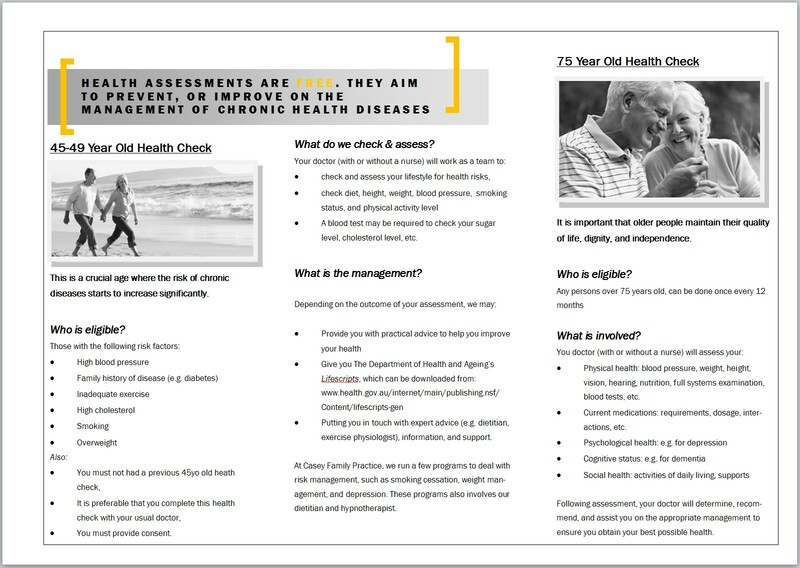 Health assessments provide your doctor with guidelines in the assessment, recognition, diagnosis, and early management of patients with chronic health problems or those at risk of developing chronic diseases, especially in certain critical age groups (e.g. 4yo, 45-49yo, >75yo). There are guidelines and requirements the doctor must complete in these assessments. Furthermore, if qualified, the government will also subsidize patients all or most of the costs of certain treatments provided by allied health professionals (e.g. dietitian, diabetes educator, podiatrist, psychologist, chiropractor, etc.). 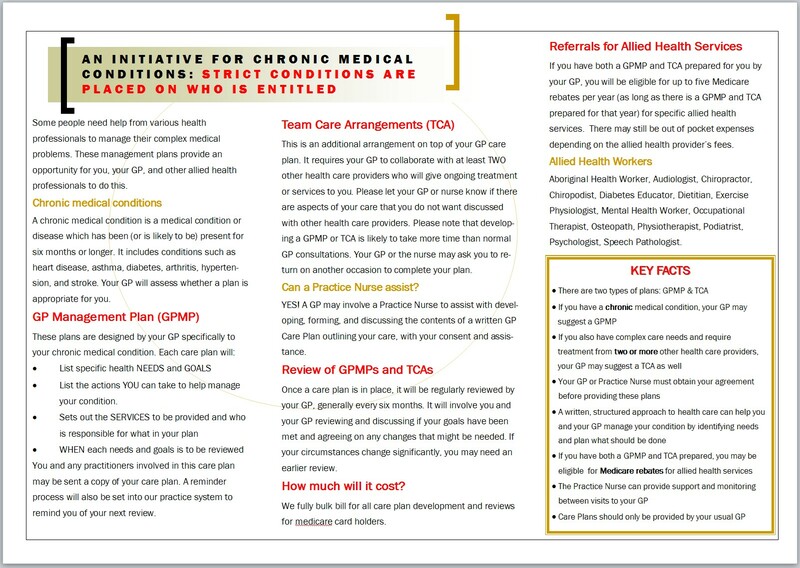 Our doctors and practice nurses participate in completing patient management plans and health assessments. We use various assessment tools at our disposal at the clinic (e.g. ECG machine, 24hr holter monitor, spirometry, skin allergy testing), together with our excellent team of allied health professionals (e.g. podiatrist, diabetes educator, dietician, psychologists, osteopath) to provide patient education to empower you to make healthy lifestyle choices and optimal chronic disease management. Our GPs provide all the required childhood immunisations from birth until teenagers, as well as postnatal checks on mother and baby. We inform the Immunisation Register of all immunisations. The government now requires that all children must complete their immunisations in a timely manner (with a few rare exceptions), especially if you wish to receive any government subsidies (e.g. family benefit payments). Furthermore, childcare, family day care, preschool, and school services also requires the child be up to date with immunisations. 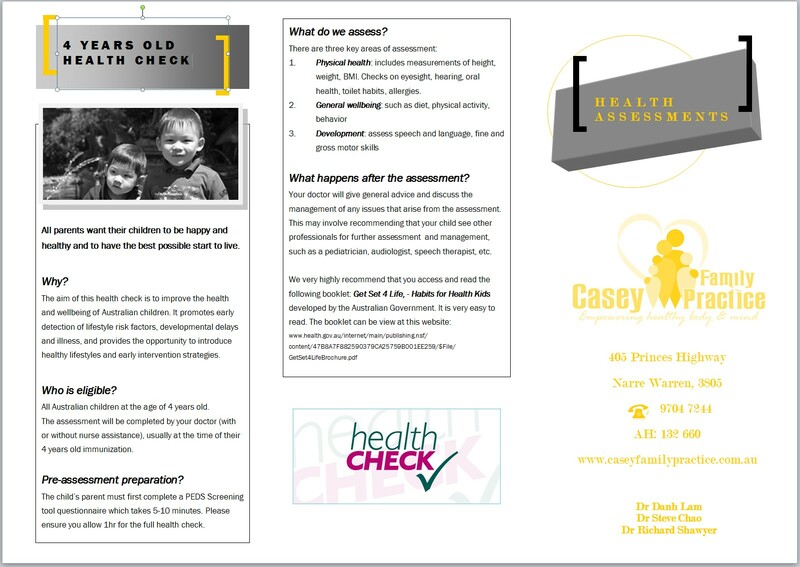 If your child has had immunisations overseas, please bring written evidence of these for us to complete an “Immunisation History“ form for you to update your child’s immunisations with the Immunisation Register.